The Great Stone Barn at the Shaker Museum Mount Lebanon is unique both for its architecture and the ways it represents the Shaker work ethic. A few minutes from Pittsfield, the remains of the Shaker central ministry at Mount Lebanon overlooks the valleys near Old Chatham and East Nassau. The buildings in the central part of the village are still standing, and many of them function as facilities for the Darrow School, a boarding school that emphasizes the arts. The buildings south of the school are home to the Abode of the Message, a Universal Sufi commune. Most of the buildings that constitute the North Family make up the Shaker Museum Mount Lebanon, which is open to the public from June to October for walking tours. 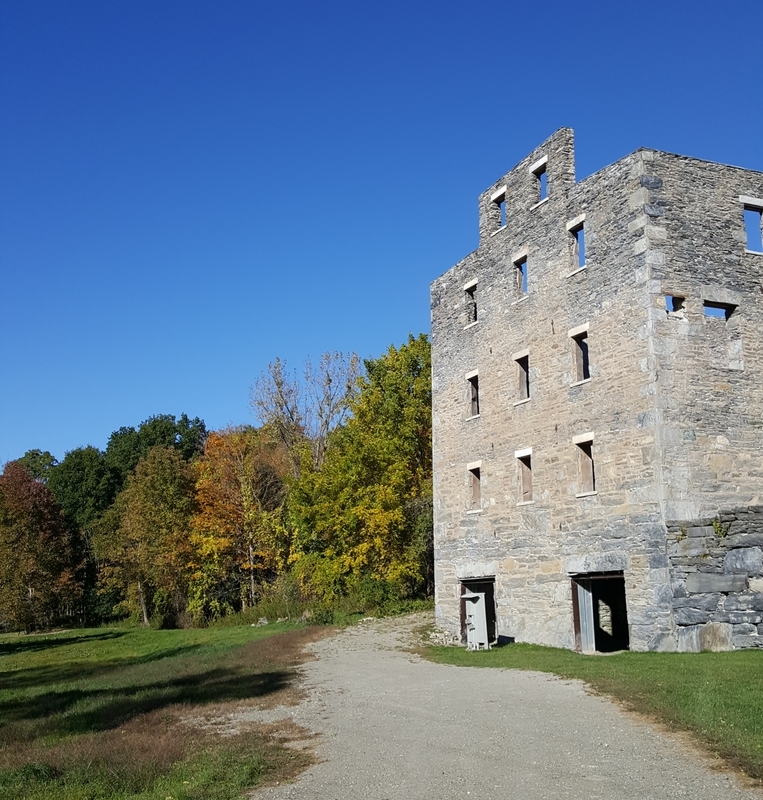 Upon pulling into the parking lot of the museum, it’s hard not to notice the largest building in the North Family – the Great Stone Barn. This barn was built in 1859, and was the largest stone barn in the U.S. at the time of its construction. It was intended to replace several smaller dairy buildings--some of the remains of which are still on the site. The Shakers meant for this three-story barn to be impressive – many of the trees in the valley below it would have been cleared, allowing the surrounding community to see the Shakers’ innovative architecture. Elder Frederick Evans and Brother George Wickersham were the driving force behind the construction of this barn and they did so within the context of innovative barns that were built both in other Shaker communities and in the outside world. Evans and Wickersham used many of the characteristics of these contemporary barns, and in Shaker fashion, they only kept the most efficient and effective ones. 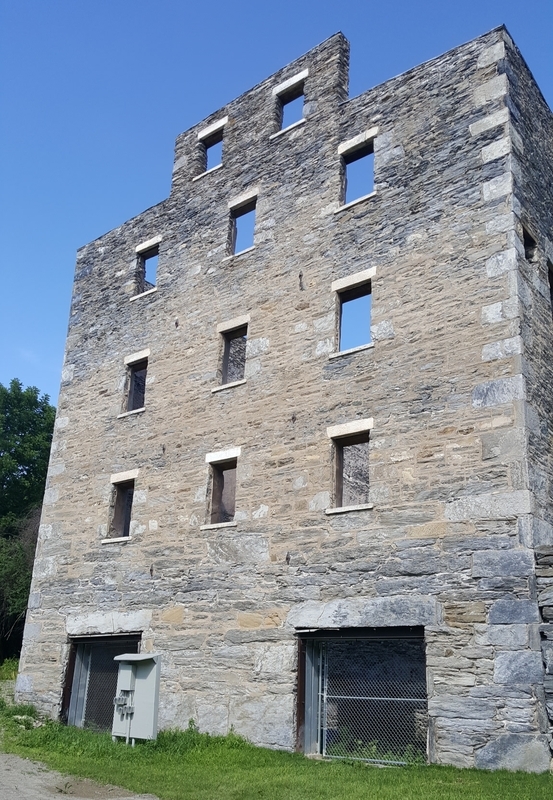 For example, they used stone for the main part of the building, flat roofs, and far more windows than contemporary barns to provide more ventilation and light. As time went on and the flat roof began to leak, so the Shakers replaced it with a more traditional gable roof and cupola, which demonstrates their willingness to revise their work in the interest of employing the best design possible. The design of this barn makes it unique. The Shakers prioritized utility in their design, and that’s exactly what they did here. The barn is built into the hill behind it, so carts could drive directly onto the third floor from the road behind it. From there, hay could be pitchforked into mows directly below. The silos are built both into the hill and inside the barn. Around 60 cows fit on the first level and the Shakers kept the smell from being overwhelming via an internal railway system that disposed of manure. The railway was U-shaped, with the ends of the U on the front-facing wall of the barn. The manure would be deposited into manure vaults in the front of the barn, from there, it could be carted directly out to the North Family pastures. This barn is exceptional not only for its innovative design, but also for the ways in which its use illustrates Shaker beliefs regarding technology and productivity. Contrary to popular belief, the Shakers welcomed technological advancements in their communities. Their saying, “hands to work, hearts to God,” meant that work was a spiritual, purifying act for them. If they could streamline the way they did work through new technology, then they were better Shakers for it. The barn furthered these beliefs because it increased dairy production and made methods of clearing and using manure much more efficient. The impressive size of the barn was also meant to attract attention from the surrounding community--whether they decided to convert to the Shaker way of life or not. This barn embodies Shaker innovation and testifies to their work ethic. The barn appears as it does today because of a fire in 1972. Since then the Shaker Museum Mount Lebanon has been taking steps to restore it. The exact cause of the fire is unknown, but the suspected cause is arson because the barn was already out of use for many years. The fire destroyed the three outbuildings, which would have made the barn look like the letter "E" from above, as well as the floors and roof of the structure. All that remains are the walls and some of the concrete floor where the cow stalls once were. The museum undertook a multimillion dollar project to stabilize the walls a few years ago and they are fundraising to restore the floor so the barn can be used for interpretation and events. From the photos shown, you can see where the center of the floor was destroyed and visitors can usually access the manure vaults below. 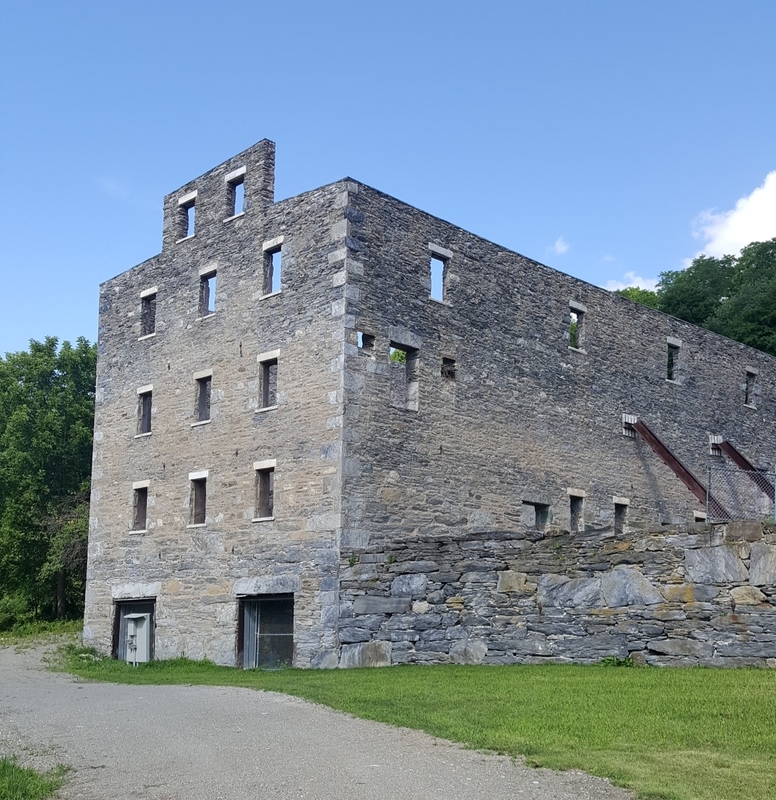 The Great Stone Barn: This is the front face of the barn. The two entryways at the ground level would have led to the manure vaults. ~ Source: Photo taken by the author in 2016. 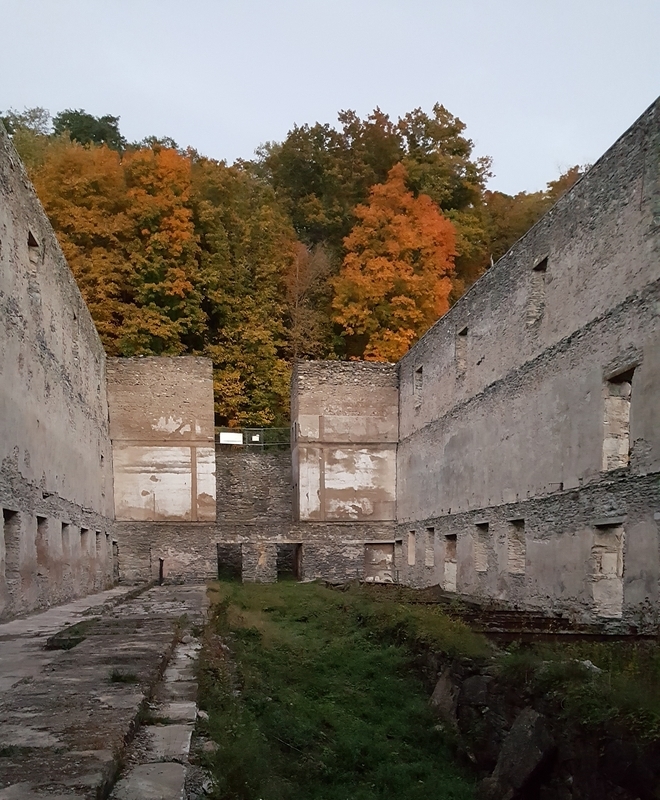 The Great Stone Barn: This photo of the back of the barn was taken in the fall of 2016. 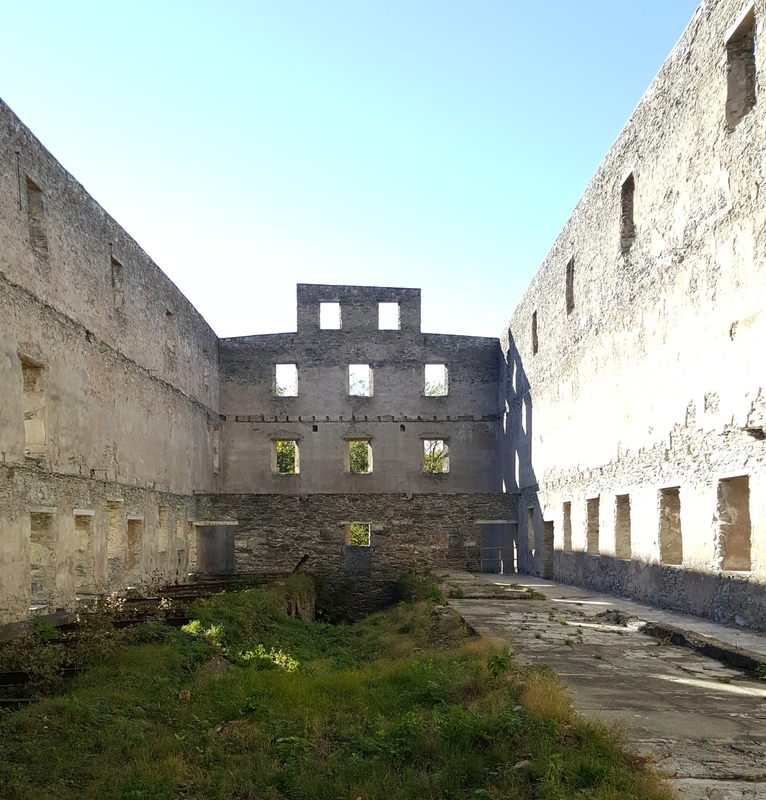 You can see the lines on the walls where the three floors once were, as well as the two rectangular pillars in the back that served as the silos. The road was directly behind the barn, and wagons drove onto the third floor of the barn through the entryway between the silos. ~ Source: Photo taken by the author in 2016. The Great Stone Barn: This photo shows the front face of the barn from the inside. You can see that roughly two thirds of the first floor is missing and overgrown with vegetation from the 1972 fire. ~ Source: Photo taken by the author in 2016. The Great Stone Barn: This angle of the front of the barn shows how the barn was built next to the North Family pastures. The trees in the left portion of the photo would have been cleared and the manure from the barn was easily hauled to the nearby pastures. ~ Source: Photo taken by the author in 2016. 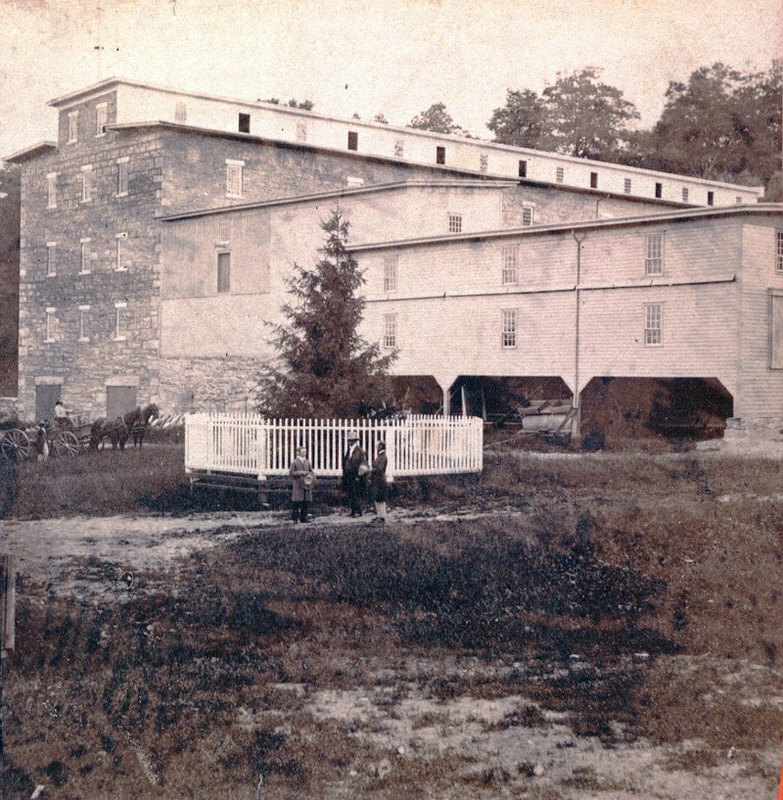 The Great Stone Barn: This is how the barn looked in 1871. The outbuildings were attached to the barn itself, and the windows provided a lot of ventilation. Additionally, the tree in the photo is still standing today. ~ Source: Irving, James. Circa 1871. From the collection of the Shaker Museum | Mount Lebanon, New Lebanon, New York. -The inside of the Great Stone Barn is usually not accessible to visitors. 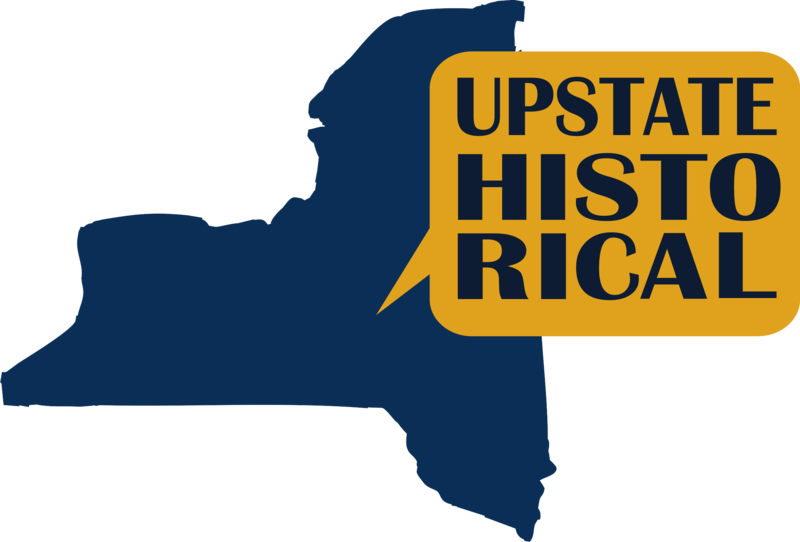 Laura Earls, “The Great Stone Barn and the Shakers: Intersections of Architecture and Utopia,” UpstateHistorical, accessed April 18, 2019, http://upstatehistorical.org/items/show/65.